While I am reluctantly giving up my jewel tones now that it is spring, one thing that I could never give up is my nail art! So I tried to come up with something light and delicate that would also make an impact. I decided on a pastel rainbow. First, I had to pick out some colors. I don't own nearly as many pastels as I do brights and darks, so this was a bit of a challenge for me. I wanted to select shades that would go well together and almost blend, rather than contrast. In the end, I went with Revlon Sunshine Sparkle, Sinful Colors Cinderella, Essie Bangle Jangle, CND Pink Wishes, and Revlon Minted. I really like how it turned out. It was just the right combination of shades, with the slightest hint of shimmer, and it got a lot of compliments. I didn't even have to use my nail art brushes. I just used the side of the brush to stripe, rather than the whole thing. When it was a little thick of a stripe, I just overlapped the next color. A coat of Seche Vite and five minutes later, I was good to go. Would this be a design you would be willing to wear? If you try the striped manicure for spring, I'd love to see some photos posted to the Facebook page! And look for the Midwest to be posted shortly for March Madness. The poll site has been down for nearly a week now, but I think it is finally up and running again. So very pretty! But it's a shame that you can see very little of Cinderella. haha Revlon Minted is gorgeous! I haven't seen that one before! Nice. Will definitely try that. I recently did a Spring inspired French Manicure with Sally Hansen Xtreme Wear "Crushed" as the base and "Mint Sorbet" for the tips. Loved the look. Definitely need to try this sometime, so cute and springy! 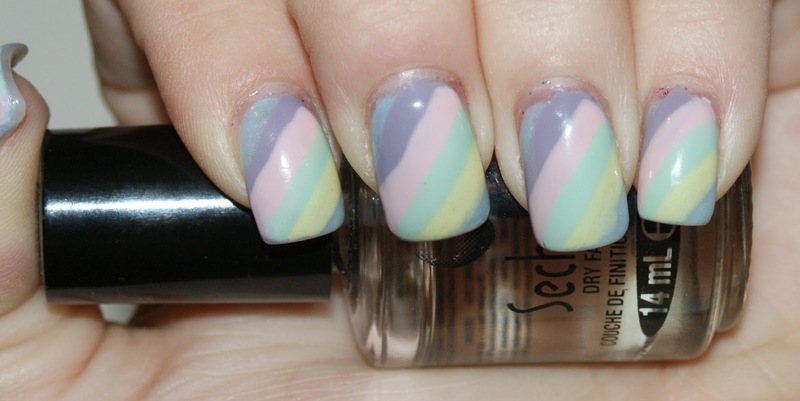 Your nails look candy coated :) Very cute!